MegaCom owns 46% of the market of mobile services in Kyrgyzstan, which is 3 million subscribers. Therefore, experienced terminators prefer SIM-cards of the operator to terminate calls because it has the largest database of customers and the best GSM-coverage in the country. MegaCom was the first mobile operator to startoperating in Kyrgyzstan. It offers a wide selection of prepaid packages - "Eldik", "Like", "Excellent", "Hit", "All Inclusive", "Bashat", and "Base". In addition, the first of these packages includes also a range of additional tariffs (Eldik 120, Eldik 160, and Eldik 210). 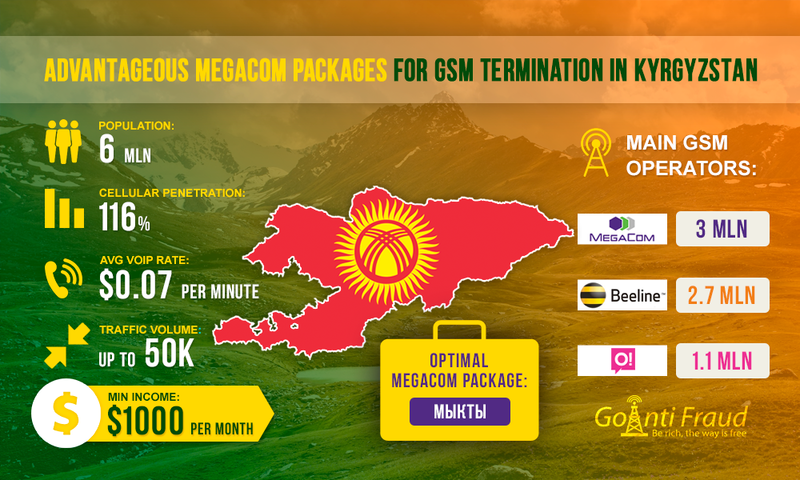 GSM termination in Kyrgyzstan will be beneficial only when you connect to packages that provide minimum tariffs for calls within the network. Therefore, the first place in terms of optimal voice termination can be occupied by the "Excellent" package (in the original - "Mykty"), providing a low cost of calls - from $0.0073 per minute. This tariff plan, unlike Eldik, does not imply a mandatory monthly fee, but the price per minute, with an average load on the equipment, is very attractive for earnings on termination. Billing at $ 0.0073 per minute provides a cheap communication within the network via "Excellent", while calls to other MegaCom numbers will cost $0.0145 per minute. The same rates are valid and when connecting to other packages such as "Hit" and "All Inclusive". They, like "Excellent", do not provide for the mandatory fee. Doing VoIP termination via these packages will get you a steady income, provided you have a reliable protection of SIM-cards from the lock. To start, you need to connect to one of the packages, install equipment and fund your account with any amount. However, many newcomers keep connecting to the "Bashat" tariff plan, which is rightly ranked third among tariffs to terminate calls. Calls within the network will cost a bit more expensive at $0.0188 per minute and $0.0145 to send an SMS. This plan, like the previous ones, does not provide for a fixed monthly fee. How much can you earn by connecting to MegaCom? Using the "Mykty" package, with an average load on the equipment, your profit will amount to about $1,000 from one channel, with the average value of voip minutes being $0.07. When you connect, for example, GoIP 32, said amount should be multiplied by the number of ports.